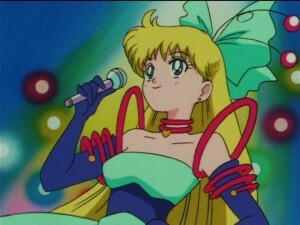 This morning the two latest episodes of Sailor Moon SuperS, episodes 154 and 155, were added to Hulu and Neon Alley. This week we get a couple more funny episodes. First Minako and Makoto compete for the affections of a kindergarden teacher and then everyone is having trouble with the pommel horse. Episode 154, Clash of Dreams: Minako and Makoto’s Broken Friendship, seems like a bit of a repeat of a Sailor Moon R episode in which we similarly had Minako and Makoto fight with each other. It seems these two characters only interact for the purpose of ruining their friendship! The two of them have a crush on the same teacher, Honjou, who happens to have a class full of brats including the especially annoying young Kotarou. 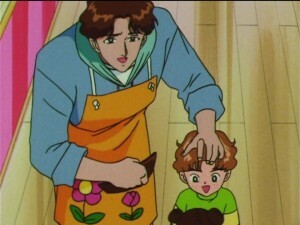 This particular kid gets on Minako’s nerves and in the ensuing chaos one of Makoto’s bears becomes destroyed, which causes a fracture in their friendship. 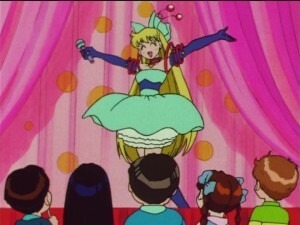 Minako tries to win over the class with a nice concert where she dresses in the most ridiculous costume! 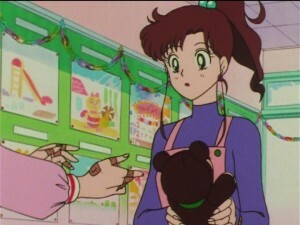 After the teacher gets targeted and the fighting is done Minako repairs the damaged bear and bygones are bygones. Then comes the big shocker, Kotarou is Honjou’s son! This dashes Minako and Makoto’s dreams, as if they somehow would not have expected him to be unavailable if it weren’t for the fact that he had a child. This is odd as he may very well have been in a relationship if he didn’t have a child and there are plenty of single parents out there. Regardless, this settles the whole affair and there’s nothing more to fight about! 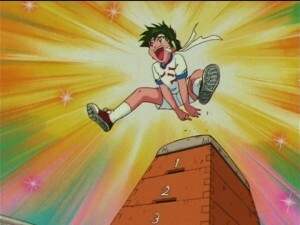 Episode 155, Overcome Your Fear: the Jump to Freedom, shows us the evils of the pommel horse. Are these things that popular in Japan? 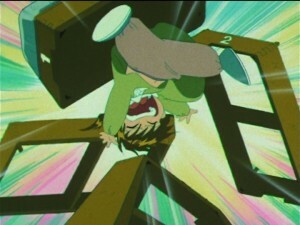 Judging by Anime I feel as if this is a dreaded thing in the formative years of all Japanese children, where they are forced to jump over a pommel horse or they will fail phys ed and be held back a year. 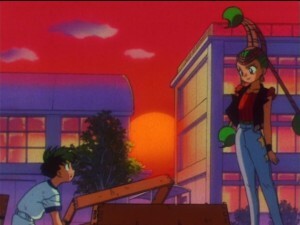 I similar recall an episode of Pretty Sammy which centred around a pommel horse. In this episode there are not one but two characters who are afraid of the pommel horse! First Chibiusa tries to duck out of school event due to her fear of the thing, possibly because in the 30th century they are still subjecting Japanese children to it, and then we learn that Kyuusuke is also afraid of it, a fear which goes back to childhood. The solution to both aversions to the pommel horse? Keep trying until you stop running into it! This is nonsense for a number of reasons. We must break down how this thing works. To jump over it you jump up and try to clear it, pushing yourself up with your hands while going over. Failing to clear it will mean either having the top of it hit your stomach or groin, or if you clear the front you will just land over it. For whatever reason all characters in this episode are seen failing to clear it by slamming right into it as if it was a wall. There is no in between where they almost clear it, just smashing into it. Beyond this no proper technique of progression used to surmount this problem. This is clearly a modular pommel horse which could be set to a lower height. This is how problems such as this should be approached! If the pommel horse is too daunting a task one should simply try it at a lower height and then raise it once comfortable! This is not the approach that Kyuusuke uses however, as JunJun of the Amazoness Quartet helps him get over his fear. This has to come down to fear of course. The pommel horse is not vanquished with hard work and training, but by overcoming an irrational fear of the pommel horse brought on by a traumatic experience. 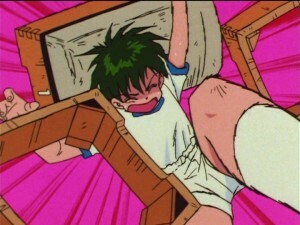 Anyway, Chibiusa pommel horses the Lemures and Kyuusuke manages to jump over the pommel horse as well. Hooray!